What are Mast Cell Tumors in Pets? Well differentiated MCT of the medial thigh has the “classic” appearance of a cutaneous, hairless, raised lesion. Mast cell tumors (MCTs) are common in dogs, representing 16-21% of all canine skin tumors. These tumors can occur in any breed, but tend to be seen most often in Boxers, Boston Terriers, and Bulldogs. Approximately 50% of cutaneous MCTs are found on the trunk and perineal region, approximately 40% on the extremities, and about 10% arise from sites on the head and neck. Mast cell tumors are often called the “great imitators” as they can have many different clinical appearances and often look like cysts, fatty tumors, or other common benign skin and subcutaneous lesions. We commonly see patients with aggressive mast cell tumors that had previously been “watched” for extended periods of time due to their lipoma-like appearance. A tentative diagnosis is usually made based on cytology from a fine needle aspirate (FNA) of a mass. Once a tentative diagnosis of a MCT is made with FNA, a biopsy needs to be performed. If it appears that the location and size of the tumor are amenable to complete surgical excision (i.e. 3 cm gross margins laterally and one fascial plane deep), then surgery should be done. However, if there is concern that it would be difficult to obtain tumor free margins based on the location of the tumor, then an incisional biopsy needs to be performed. WHAT DOES THE HISTOLOGIC GRADE MEAN? Histopathology (biopsy evaluation) is essential for establishing a “grade”. A grade (I-III) is assigned to a patient’s tumor based on criteria the pathologist uses to determine how aggressive the tumor appears under the microscope. Previously, the histologic grade was the main criteria we used in predicting a patient’s prognosis; however it is not always accurate in predicting the outcome of an individual patient’s case. Approximately 75% of all canine MCTs fall into the category of grade II tumors. The biologic behavior of tumors in this large group (Grade II) is noted to be extremely variable. For this reason, in addition to histologic grading, we also perform “mast cell tumor proliferation panels” on all biopsy specimens. 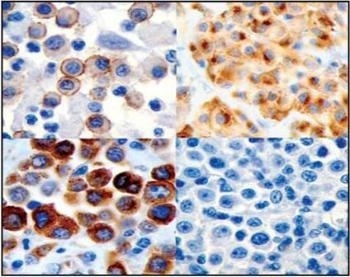 The panel consists of a cell proliferation analysis (PCNA, AgNOR, Ki-67), a c-kit PCR, and KIT immunohistochemistry (IHC) to analyze the expression of this tyrosine kinase receptor. Research indicates that a prognosis developed from this combination of tests is highly correlated with survival rates. A newer grading system described by Dr. Matti Kiupel and his colleagues at MSU uses a classification of either "low grade" or "high grade". This eliminates the broad grade II category described above that can be so confusing. Dr. Kiupel's system appears to be accurate in determining biologic behavior or mast cell tumors and is the system we prefer at ACIC. In determining the appropriate treatment for a pet with mast cell tumor(s), we utilize a combination of the histologic grade, proliferation panel, clinical history, size and location of the tumor, to help give pet owners an appropriate treatment course and prognosis. Previously, the histologic grade was the main criteria we used in predicting a patient’s prognosis; however it is not always accurate in predicting the outcome of an individual patient’s case. Approximately 75% of all canine MCTs fall into the category of grade II tumors. The biologic behavior of tumors in this large group (Grade II) is noted to be extremely variable. For this reason, in addition to histologic grading, we also perform “mast cell tumor proliferation panels” on all biopsy specimens. The panel consists of a cell proliferation analysis (PCNA, AgNOR, Ki-67), a c-kit PCR, and KIT immunohistochemistry (IHC) to analyze the expression of this tyrosine kinase receptor. Research indicates that a prognosis developed from this combination of tests is highly correlated with survival rates. In addition to information regarding the grade and proliferation panels, it is critical to know if the margins of the tumor are contained within the surgical specimen, meaning that the tumor in its entirety has been removed. Not only do we need to know that the margins are tumor-free, but we need to know how wide the tumor-free area is. Ideally, 5 mm margins under the microscope should be present for adequate control of localized disease. KIT staining patterns for MCTs. Upper left: grade I; upper right, grade II; lower left, grade III; lower right, negative control. Courtesy of Dr. Matti Kuipel, MSU. Once a mast cell tumor is diagnosed, further tests are needed to determine if the disease is localized or has spread. Generally, thoracic (chest) radiographs, abdominal ultrasound, aspirates of any enlarged lymph nodes, bone marrow aspirate (if extensive disease suspected), CBC, chemistry panel, urinalysis, and buffy coat analysis are tests that could potentially be needed. We will discuss case specific issues with you to determine what staging tests are appropriate. Surgery: Surgery is the treatment of choice for the majority of mast cell tumors. An attempt should be made to obtain tumor-free margins. Tumors tend to spread their cells far beyond the visible limits of the mass, therefore a large portion of normal appearing tissue around the tumor must be removed. Typically, a 3 cm lateral margin and one fascial plane below the tumor is required to obtain microscopically tumor-free margins (see diagram below). When the location precludes complete surgical excision, radiation therapy is a very effective modality of treatment. Wide and deep surgical borders are needed to adequately excise mast cell tumors. A common mistake is to “shell out” the tumor which invariably causes inadequate excision of all microscopic malignant mast cells. Radiation Therapy: Radiation is recommended for patients with inoperable tumors or for those patients in which tumor-free margins could not be obtained surgically. Recently published studies have indicated that the recurrence rate of mast cell tumors removed surgically with incomplete margins (tumor cells still present at the surgical borders) has been under 20%. However, there is a risk of waiting and allowing for possible regrowth as second tumors in the site can increase in grade and aggressiveness. The response to radiation therapy for MCTs is excellent. Greater than 80% of patients with grade II tumors treated with surgery and radiation therapy were disease free 5 years later. Even in higher grade tumors, local control can often be achieved. Chemotherapy: Although each case is different, at ACIC we generally recommend chemotherapy for patients with simultaneously occurring multiple tumors, histologically high grade tumors, tumors with unfavorable proliferation panels, or for patients with regional lymph node involvement or systemic disease. The most commonly used chemotherapeutic drugs are lomustine (CCNU), Vinblastine, and prednisone. Newer tyrosine kinase inhibitors are potentially beneficial for patients with mast cell tumors and are sometimes recommended when traditional chemotherapy or radiation therapy have proven to be ineffective.